Academy Award nominee Daniel Barber (THE TONTO WOMAN) makes his feature directorial debut with this gritty critique on contemporary British society starring Michael Caine as an elderly shut-in who's spurred to action by a senseless act of violence. 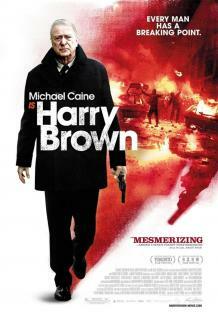 Harry Brown (Caine) resides in a desolate public-housing apartment block as his sickly wife lies dying in a local hospital. He spends most of his days in solitude, only getting out to play the occasional game of chess at a nearby pub with his best friend, Leonard (David Bradley). The days of basic human decency seem to be a thing of the past, because in recent years barbarous drug dealers and gangsters have overtaken the dilapidated complex. Killing is a way of life for these young thugs, and as a result overburdened detectives Frampton (Emily Mortimer) and Hicock (Charlie Creed-Miles) are essentially relegated to knocking on doors and notifying parents when their children have been killed in the latest fracas, instead of investigating the crimes and jailing the guilty parties. When Leonard is murdered just feet from his own apartment, former Royal Marine Harry utilizes the skills he learned while fighting the IRA to take on the aggressive chavs who have intimidated the police into inaction.